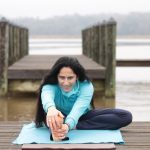 Cow Pose (batilasana) is an easy and gentle way to warm up the spine and release tight back muscles to prepare for asana practice in general and for backbends in particular. Cat Post (marjayasana) is a gentle way to warm up the spine and activate the inner core in sync with the breath. 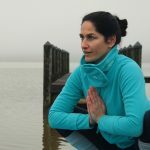 Lotus seat (padmasana) with hands in a mudra help with grounding before asana or meditation practice and mudras help to focus on particular aspects of the self. Prayer Squat / Garland Pose (malasana) stengthens and stretches our ankles and groins as well as lower back. Keep your heels on the floor. If your heels don’t reach the floor, roll up a blanket and support your heels. Half Lord of Fish Pose (ardha matsyendrasana) energizes the spine and stimulates the digestive fire. Lizard Pose (utthan pristhasana) This pose counteracts the effects of our modern day lifestyle with too many hours spent sitting. It stretches the groin and inner hamstrings while preparing the body for deeper hip openers. It is beneficial to aid with indigestion, constipation and sciatica but should be practiced with caution if any knee injuries are given. 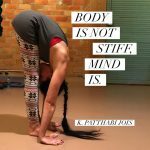 One-Legged King Pigeon Pose (Eka Pada Rajakapotasana) is the king of hip openers – supine threat the needle and half pigeon are poses that prepare for this pose. Devoted Warrior is a variation of Warrior II. 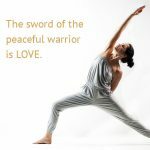 It emphasizes ahimsa (non-violence) where the warrior while standing his ground and expressing calmness and stamina is still committed to peaceful and non-harming actions. Tree Pose (Vrksasana) is an all levels standing balance. It tones thighs, calves, ankles, and spine, stretches the groins and inner thighs, improves sense of balance, relieves sciatica, and reduces flat feet. Practice with caution when are experiencing headache, insomnia, low blood pressure, vertigo, and high blood pressure (don’t raise your arms over head). Eagle Pose (Garudasana) builds strength, flexibility, stamina and focus. It strengthens and stretches the ankles and calves, stretches the thighs, hips, shoulders, and upper back, and improves sense of balance. Numerous lymph knots are stimulated during this pose, making it perfect to assist with detox. It pretty much like giving yourself a lymph drainage. Students with knee injuries should avoid this pose. Standing Head-To-Knee Pose (Dandayamana Janushirasana) is a great pose to build focus, balance, stamina, and flexibility. You can do both: stand your ground and humbly bow down. Besides the obvious benefits such as stretching the spine, shoulders, hamstrings, and groins, it also has a calming effect on the brain and helps relieve mild depression. It stimulates the liver and kidneys, improves digestion, helps relieve the symptoms of menopause, relieves anxiety, fatigue, headache, and menstrual discomfort. It is considered therapeutic for high blood pressure, insomnia, and sinusitis. Practice with caution when you have asthma, diarrhea, or knee injury. Extended Hand-To-Big-Toe Pose (Utthita Hasta Padangustasana) is an advanced standing balancing pose. It strengthens the legs and ankles, stretches the backs of the legs, and improves sense of balance. Always warm-up well before practicing this pose. Actively press your extended leg (big toe) into the hand to support balance during this pose. Practice with caution and maybe wall support when experiencing ankle or low back injuries. Use yoga strap around extended leg to modify until flexibility improves. Practice as Reclined Extended Hand-To-Big-Toe as a modified, beginner-friendly version. Standing Forward Fold (uttanasana) is a deep stretch inversion. It is practiced to calm the brain and relieve stress and mild depression. It stimulates the liver and kidneys, stretches the hamstrings, calves, and hips, strengthens the thighs and knees, and improves digestion. Helps relieve the symptoms of menopause, reduces fatigue and anxiety, relieves insomnia, and is therapeutic for asthma, and high blood pressure. Don’t practice this pose while menstruating, having headaches or migraines, and intense lower back pain. Head-To-Knee Forward Bend (Janu Sirsasana) is a great pose that can be practiced by all levels of students. 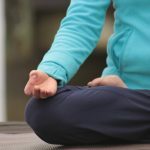 Besides the obvious benefits such as stretching the spine, shoulders, hamstrings, and groins, it also has a calming effect on the brain and helps relieve mild depression. It stimulates the liver and kidneys, improves digestion, helps relieve the symptoms of menopause, relieves anxiety, fatigue, headache, and menstrual discomfort. It is considered therapeutic for high blood pressure, insomnia, and sinusitis. Practice with caution when you have asthma, diarrhea, or knee injury. Don’t flex the injured knee completely and support it on a folded blanket. Plow Pose (Halasana) is another pose that teaches us to mind our own business and not be so distracted by the noises around us in the world. It calms the brain, stimulates the abdominal organs and the thyroid gland, stretches the shoulders and spine, helps relieve the symptoms of menopause, reduces stress and fatigue. Do not practice this pose with acute lower back or neck injuries, diarrhea, during menstruation, nor if you have asthma and high blood pressure. This variation of halasana teaches us to listen within. Wheel Pose (Urdhva Dhanurasana) energizes you and strengthens your arms, legs, abdomen, and spine. 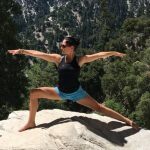 To prepare for this pose practice back bends such as bow and sphinx pose, shoulder openers such as extended puppy pose, low lunge and camel pose to lengthen your quads and psoas. Camel Pose (ustrasana) is a beautiful heart opener. It stretches the entire front of the body, the ankles, thighs and groins,	Abdomen and chest, and throat. It lengthens the hip flexors (psoas), strengthens the back muscles and thus improves posture. It stimulated the inner organs. It helps relieve mild backaches, menstrual cramps, and fatigue. Don’t practice if you experience insomnia, migraine, high or low blood pressure, or serious low back or neck injury. 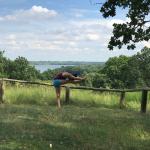 Bow Pose (dhanurasana) stretches the entire front of the body, ankles, thighs and groins, abdomen and chest, and throat, and deep hip flexors (psoas). Simultaneously it strengthens the back muscles, improves posture, stimulates the organs of the abdomen and neck, relieves constipation, fatigue, anxiety, and menstrual cramps. Practice with caution when experiencing high or low blood pressure, migraine, insomnia, and serious lower-back or neck injury. Variations of Side Plank (vasisthasana), here with a bind in half lotus, are great to strengthen the inner core, shoulders, and sense of balance. Here is a variation with legs in half-lotus and the arm going behind the back to bind with the big toe. 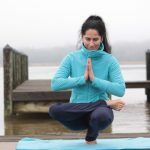 High lunge is another pose that is part of the Sun Salutation (surya namaskar) and foundation to many other poses building leg strength and a sense of grounding. Here practiced with a bind underneath the front leg which requires to open the shoulders and chest to maintain stability and flow of breath. Crow Pose (bakasana) one of my favorite hand balances – opens the door to a whole chapter of arm balance variations. It strengthens the abs and arms, and builds an ease of focus. 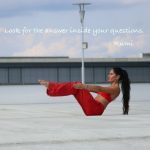 Lotus Seat (padmasana) lifted and balanced on two hands – learn how to carry your own weight. Pose Dedicated to the Sage Koundinya I (Eka Pada Koundinyasana I) requires a twist from the abdominal center, arm balance, and leg awareness. My kids always say that I look like a break dancer in this pose which makes me laugh. Variations of Side Plank (vasisthasana), here with an extended leg, are great to strengthen the inner core, shoulders, and sense of balance. Here is a variation of plank combined with hand-to-big-toe pose. Four-Limbed Staff Pose (chaturanga dandasana) is a pose of Sun Salutation (surya namaskar) and great to build core, arm and shoulder strength as a foundation for various other yoga poses.